I have a 300gb Sata hard drive that I partitioned into 3 partitions: (C:(System, OS) 60gb) - (D:(Music and Videos) 100gb) - (E: (My Studio) 140gb) Something happened and D: & E: disappeared. I bought a program called "Mini-tool Power data recovery" and I was successful in recovering all of my lost files. Now I want to repartition the hard drive back and just use it as one Partition because I bought two more hard drives to do what I had done with the hard drive in question. When I click on "my computer" it shows my C: as "28.8GB used of 58.5GB". When I right click "My Computer" and Click "Manage" it shows C: as "289.09GB". I want to stretch the 58.5GB to utilize the whole 289.09GB of the drive which should be 300GB which in tell means that there is almost 11GB still unaccounted for. What do I do to make this happen without reformatting the the whole drive and just start all over? Please help. 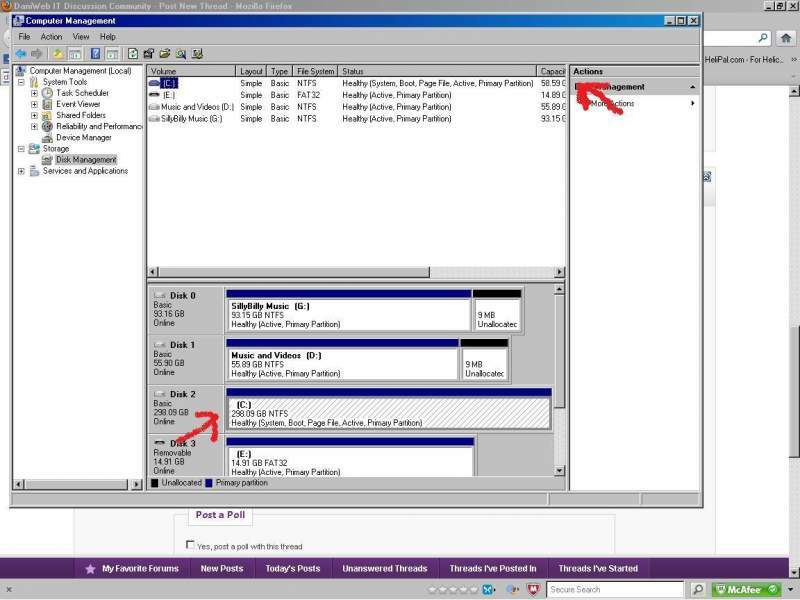 in disk manager right click on D:\ and G:\ and check delete Volume,then right click them format them to ntfs same as C:\ you then should be able to right click on C:\ and click on extend volume ,i think maybe twice to get it to extend to the other 2 partitions . that what i just did anyway to a laptop drive i had lying around ,it had 2 partitions now has one bigger one . also it normal for a 300gig hdd to format to less than 300 ,it all more than i can explain . 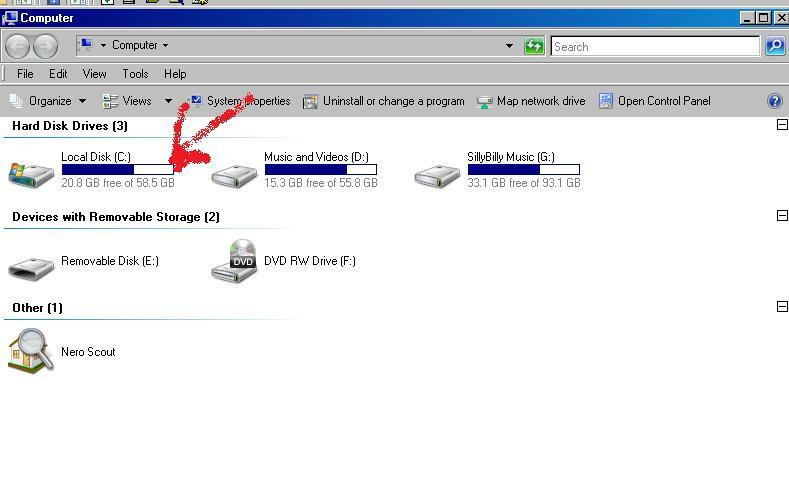 ok,, I might have confused you,,,, D & G now are my new drives I have,,, The partitions on the C: is whats missing... Notice the one picture I attached is in my computer,,, it shows the hard drive at almost 60GB? Well if you look at the other picture, C: shows almost 300GB. The partitions are not showing up on the C: Just the OS/System Drive which is at almost 60GB. It will not let me extend it either to the rest of the 240GB of the 300GB the drives capacity is. I fixed it!!! wooooo hooooooo!!!!!! BCEDIT in command prompt,,, list disk: then select disk: then list volume: then select volume: then extend volume ? (? is whatever volume your extending! It now shows the 300GB hard drive in "My Computer" as 300GB and only 260GB of 298GB free!!!! SOLVED!!! How to setup Applications in a Drive other than C: Drive? Copy and Paste broken in Windows Explorer! Why do MP3 music come with .INI? and Desktop .INI?